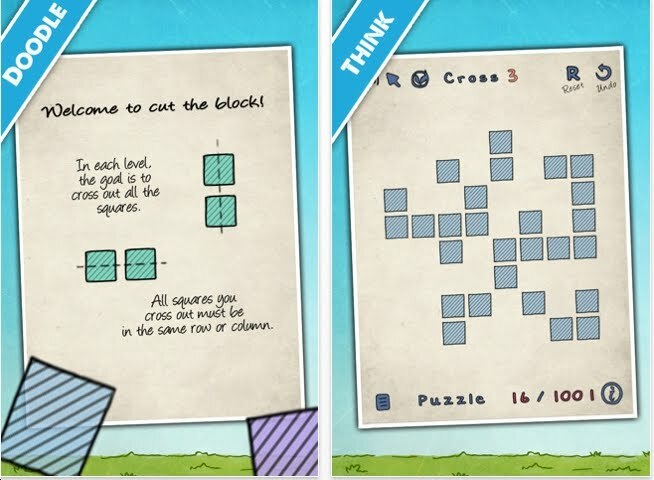 Cut the block comes from ColorMoon Games. Object: drag your finger to cover 2 or 3 blocks at a time. Eliminate all the blocks. Seems random - however one must think strategically. Well done! 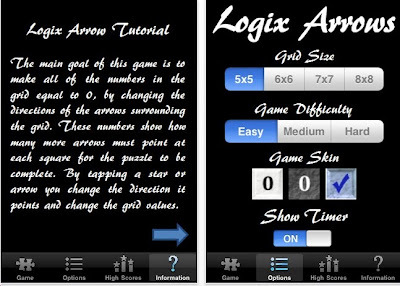 The free version has 24 levels, the paid has 1000. Flipple is similar to Lights Out. 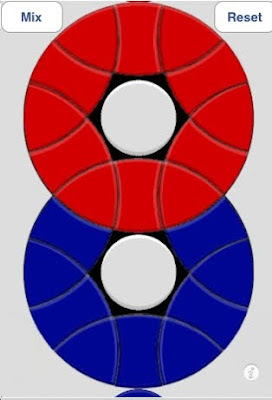 The object is to make all the tiles the same color. Double tap on one tile and that tile and its neighbors will Flipple! Here's where Flipple gets interesting: drag your finger along any row or diagonal and make just those tiles flip. I have a friend who's a retired mathematics professor. He has compiled an extensive collection of Lights Out versions. He will be thrilled to see this one! 10:45 – 11:45 Lecture: The Making of a Virtual Puzzle by Robert Stegmann http://home.comcast.net/~stegmann/halloween/index.htm Please explore the link beforehand. 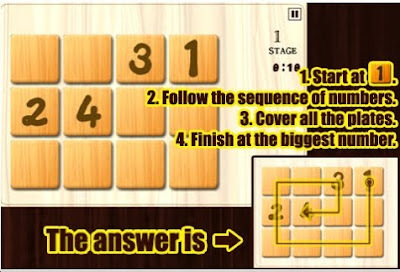 Do you like the 15 Puzzle? There have been hundreds of variations. On first glance, this version seems easy. Not so! The object: get the numbers in sequential order with the center blank. 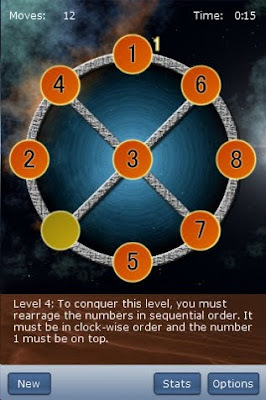 Notice the 2 diagrams: That level has 8 spokes - EASY. 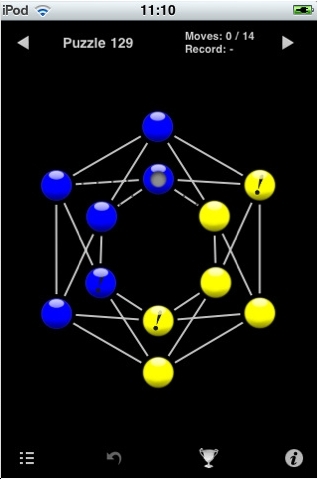 The second image has 4 spokes - harder. 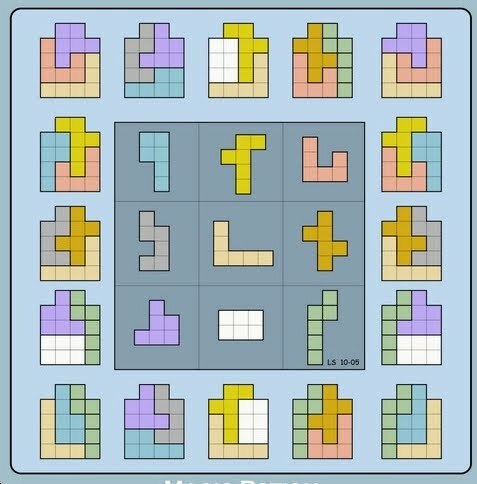 Altogether there are 10 puzzles. I solved the first 9 puzzles in about 20 minutes. 9:17 on puzzle #9. Puzzle 10 - I'm stuck. 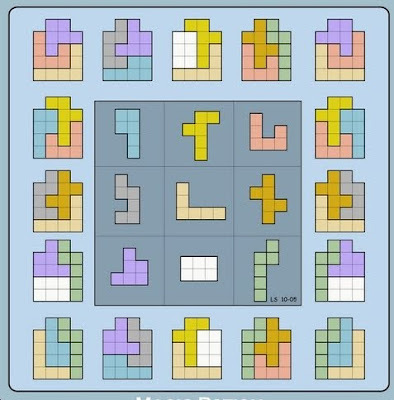 We look forward to future sliding tile puzzles from Chris Sell. Nice job! It isn't everyday the New York Times features a mathematician. 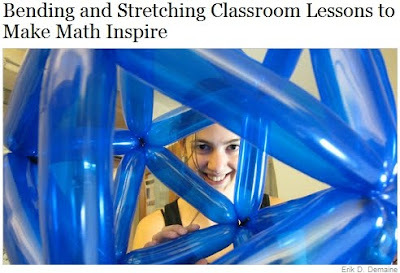 Then again, Vi Hart is no ordinary recent math-major grad. 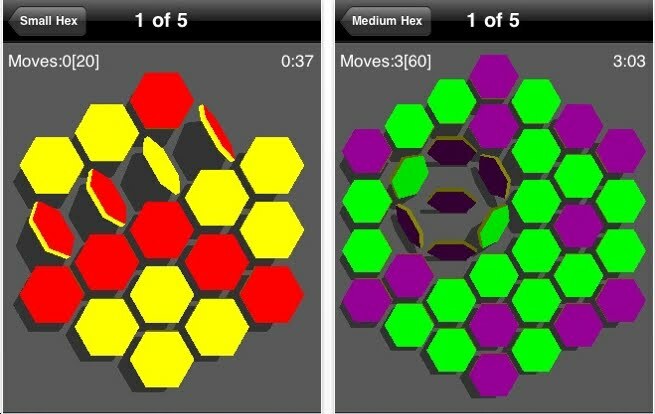 Quell is another tilt maze puzzle. 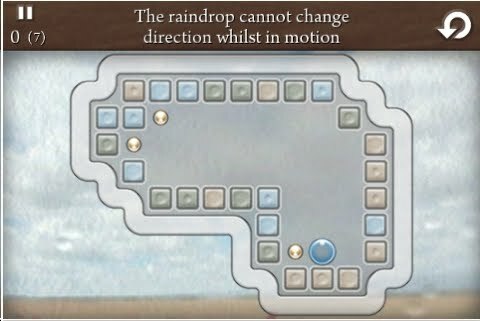 The object: move the raindrop (blue circle) to collect all the golden dots. Look at the red arrow. If the raindrop falls down onto that, it disintegrates. Landing onto it from the side or below - you're okay. Look at the blue arrows. They point to wormhole. I solved all 80 puzzles in about 2 hours. Good fun & well designed. You should also download: Blaxx & Brain Freeze. Both are very similar but with different elements. 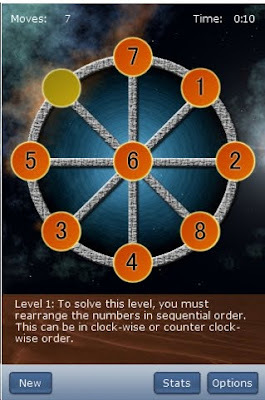 Lewis Boadle is the puzzle creator of Quell. We look forward to future level packs! Chrome - 8 is terrific! 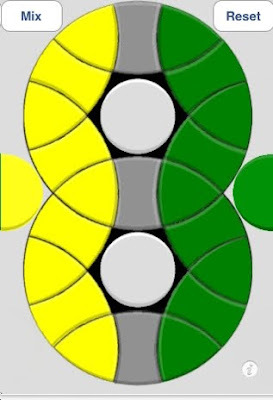 Slide the balls along the lines so that no ball is connected -by a line - to another ball of the same color. 150 'Apprentice' levels. Look at the top diagram - that's one of the 'Master' challenges. Notice the exclamation point. 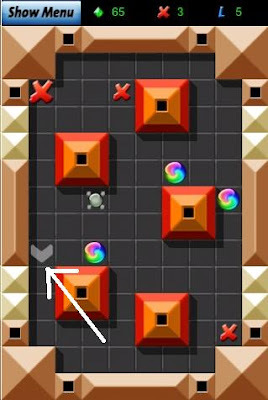 That item cannot move. The second diagram: look closely. 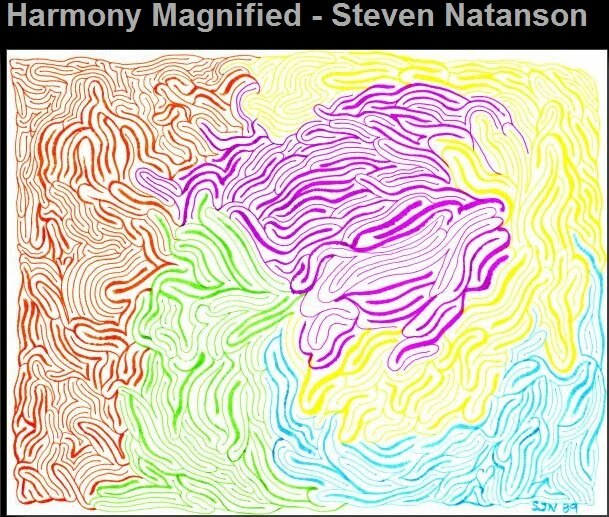 Do you see the outer ring around each of the balls? That ring designates what color ball should go in that slot. Brain Freeze is a tilt puzzle. Not a dexterity puzzle! More like a tilt-maze puzzle. The object is to match up like pairs - blue star with blue star - horizontally or vertically to make them disappear. Grey squares are walls. Black squares are black holes. If a pieces lands in the black hole - it's gone forever. Squares with a padlock cause an object to stick there forever. Chrisoph Vogelbusch produced this great diversion. The XL edition has 400 challenges. I am on level 35 - after about 1.5 hours. 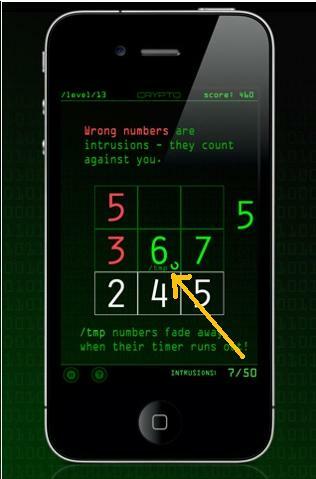 Listen up kiddies: Numeric Paranoia is one of the best iphone puzzle apps! 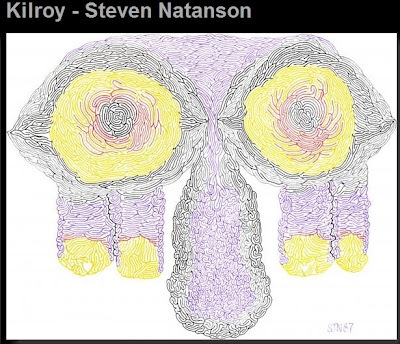 It's topological in nature. Start at tile #1. Drag your finger over all the tiles. 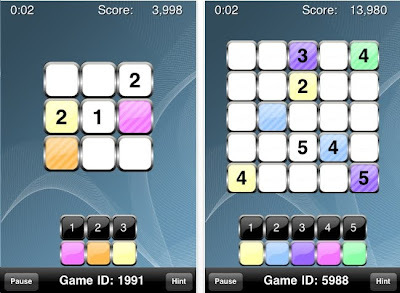 The #2 tile is not necessarily the next tile after #1, but it must come before the #3 tile. Meaning, there could be a slew of blank tiles between #1 & #2. 264 challenges in all. The updated version came out yesterday. No idea who the author is. Some guy who calls himself PurpleRobo! His web page has Korean characters. 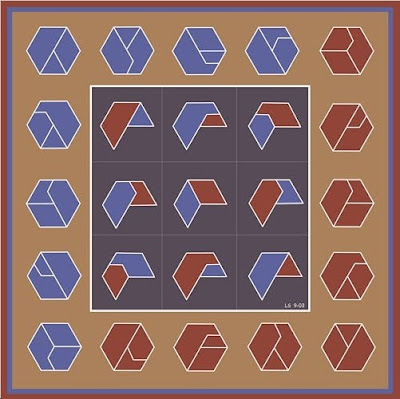 Lee Sallows has written a book on Geo Magic Squares. I've not had a chance to peruse it. However, it is intriguing, though I do not claim to grasp the essence - yet! On a side note: many people have written to inform me of Rubik's Cube iphone apps. Thanks. There are so many! I am interested in learning about the ones that offer something more novel. We admit: sudoku has gotten boring. However, there are many versions that tweak the rules and spice it up. Cohabit is one of them. 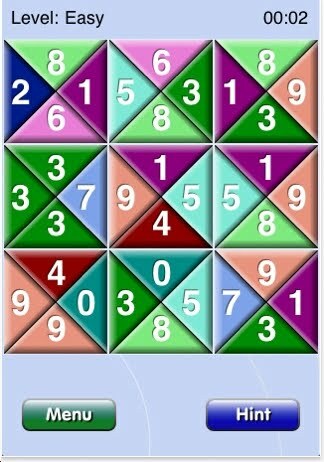 The object is to assign a number AND color to each cell. Look at the large photo. We already have green 1, 4 & 5. Can you see why green 2 must be placed in the bottom row in the 3rd column? 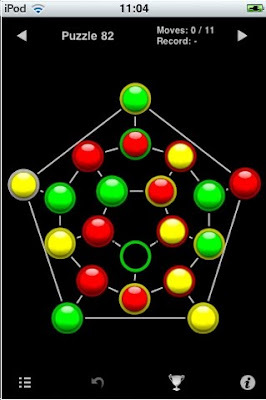 Next, can you figure out where the green 3 goes? 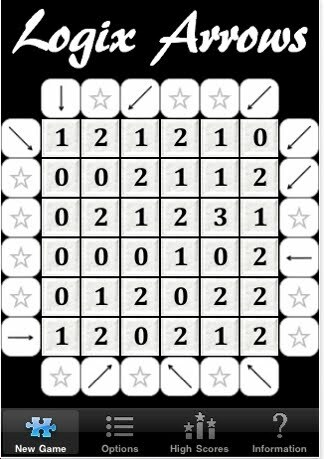 Bryan O'Malley and his team have provided 4000 puzzles for $1.99 No need to buy sudoku puzzle magazines anymore. 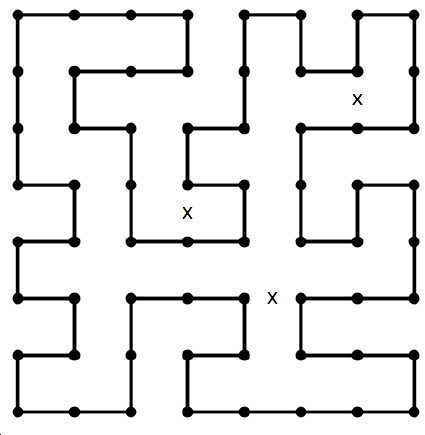 The grid sizes: 3x3, 4x4, 5x5 & 7x7. 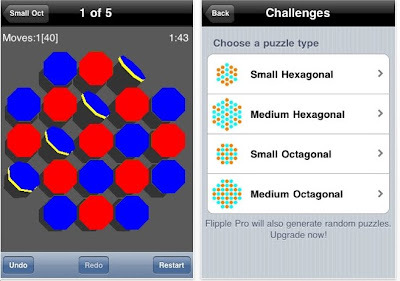 Remember: this blog only features great iphone puzzle apps. If you discover a puzzle app that I may not be aware of: shoot me an email. Or post a comment. Many years ago I read Flatland by Edwin Abbott & Sphereland by Dionys Burger. I recommend both highly! Now we have a wonderful 4-dimensional maze via a hypercube. 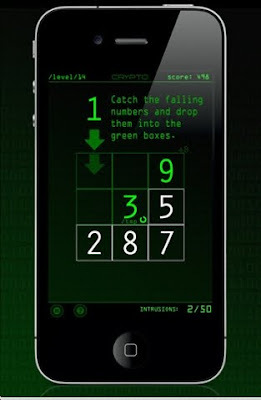 I was not able to download and sample this set of puzzles because my ipod touch does not have the latest software. However, having watched the video of this, I am 1 step closer buying an ipad. Hipercubo will be the first app that I will download. Roger Sodre from Brazil is the creator. 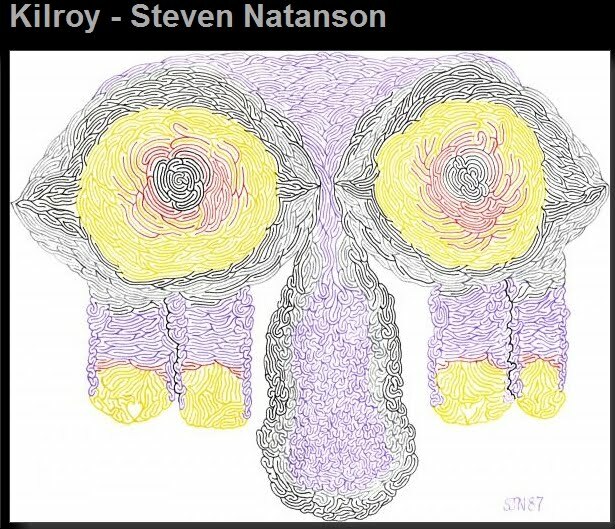 He spent 6 months on this. 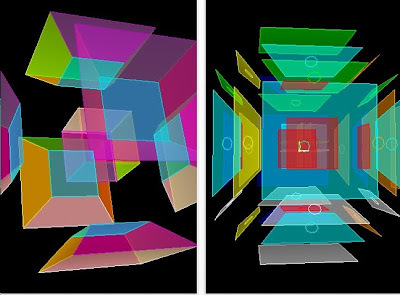 "Hipercubo is a puzzle game that takes place inside a Hypercube, a four-dimensional cube. 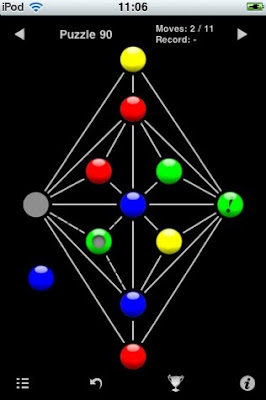 Within it, there's 8 regular tridimensional cubes interconnected, each one of a different color. You can run through the cubes forever and never reach the end. The goal is to bring all the colors asked to the center of the Hypercube within the time limit. 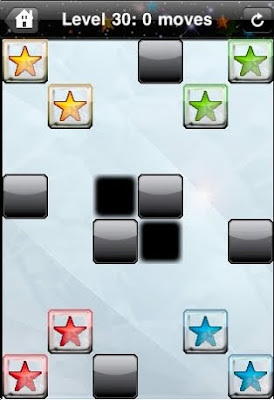 The first levels are easy, but as you progress through the challenge, it starts to get complicated, as connections are closed and obstacles atart to appear inside some cubes. There's a Full Screen mode where you can appreciate the Hypercube being deconstructed with the accelerometer. With a TV or Video cable, you can watch it on a monitor or TV. 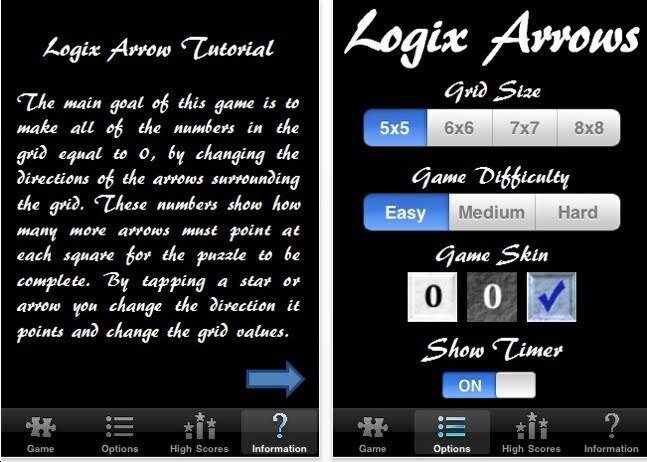 The new version now runs on iPad and is ready for the new Retina display on iPhone 4 and iPod Touch 4. 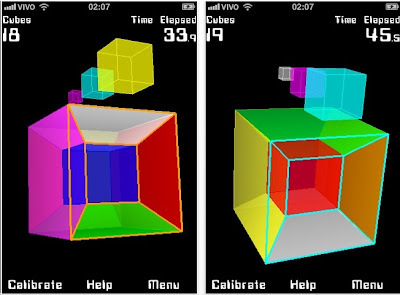 There's a new scoring system, based on cubes flipped, the level and speed, with global scoreboard managed by Apple's Game Center. You can also clone the game to a monitor or TV. The distribution model have also changed. 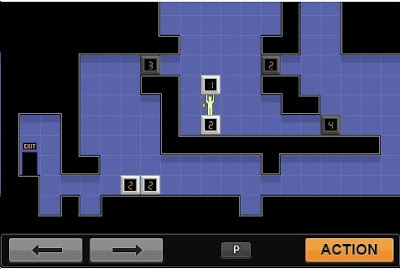 The game was free, with upgrade to the full game after the 10th level. Now there's the free Hipercubo Freestyle, including only the Freestyle mode, where you can flip the Hypercube as long as you can. The full Hipercubo have all the 56 challenge puzzles." Rob Cutler has produced a fine set of puzzles here. This is one of those puzzles that could never be presented for a solver to use pencil/paper. The object: point all the arrows into the grid so that each numbered square is the target of that many arrows. Rob has produced some other interesting puzzle apps. We'll report on those at a later date. 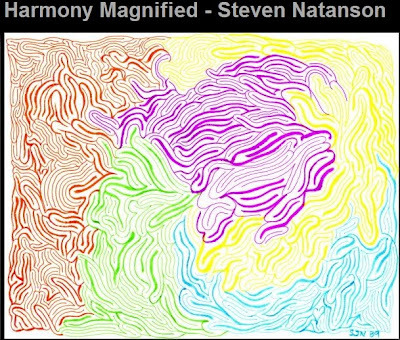 Steven Natanson is an artist is draws big wonderful mazes. Similar to Elizabeth Carpenter's work. Explore his web page! My good friend Doug Engel is the most under-appreciated puzzle designer today. He produced these 3 circle puzzles in the mid 80's. This app duplicates them just fine. 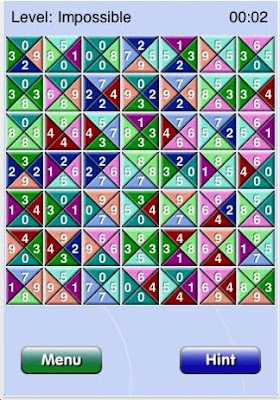 However, I thought I knew everything there was - mathematically - to these puzzles & could solve them easily. Then Doug decided to expand his circle puzzles to demonstrate how truly complicated they could get. 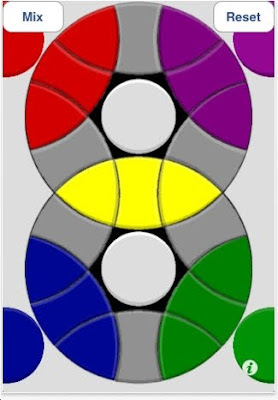 This puzzle: first align the colors, then make sure arrows point to 12 o'clock. 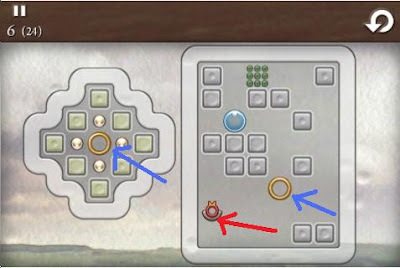 It completely changed my entire analysis of these circle puzzles upside down. Doug now calls these Battle Gear Puzzles and has added more pieces to some variations. Good God man! 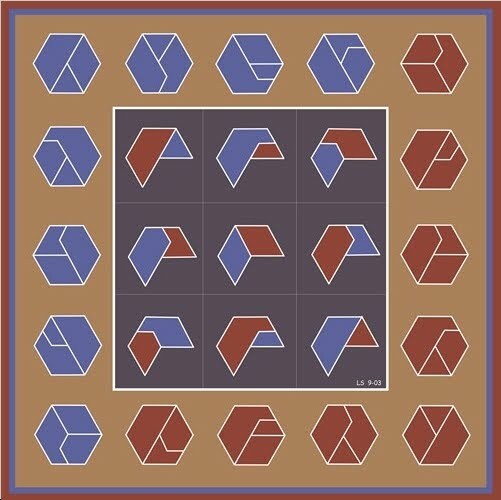 Even better, go to Doug's site http://www.puzzleatomic.com/FLATLAND%20GEARS.htm and buy the physical puzzles & the variations. Tell him I sent you & he might give you a discount if you order a lot. First of all I object to the term ‘jailbreak’ in this situation. The term ‘jailbreak’ should bring to mind images of prison tunnels, a riot, guards being held hostage, tear gas, and mayhem. Now consider the iphone owner who ‘jailbreaks’ his iphone. Let’s move on. A few days ago I was comparing favorite iphone apps with 2 guys. They instantly recommended that I ‘jailbreak my ipod touch and download everything for free. I’m know those 2 guys would not recommend walking into a deli and stealing a candy bar. Yet, it’s okay to steal intellectual property if the owner never discovers it? As a citizen of the US, or any nation, do people get to choose which laws to follow and which to ignore? If you’re laughing these arguments off, consider this: very few iphone app programmers are making any money. The vast majority of iphone apps make peanuts or even lose money. As it is now, you can sample the ‘Lite’ version of an app, and then pay the .99 for the full version. This will encourage programmers to make more apps. Don't be a cheapskate, pay for the program. If you choose to 'jailbreak' your iphone please don't boast that you're breaking the law; such actions and proclamations encourage others. Last month, this Mechanical Puzzle Correspondent received some 100 emails queries. 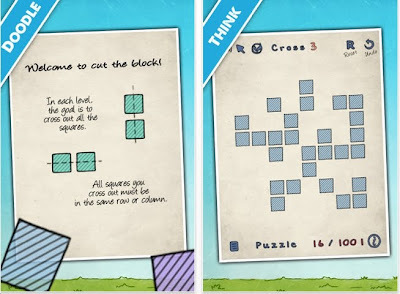 Most often asked: can you solve every level of every puzzle? No, I cannot! 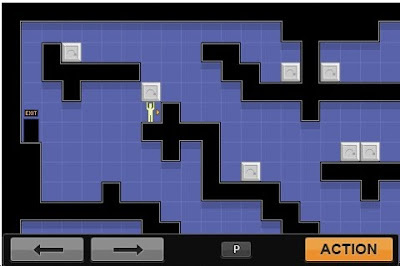 Right now I'm stuck on level 62 out of 100 on a terrific puzzle, which I will review at a future date. Which brings me to Blaxx. Stefan Ritter has produced a nice variation and combination of Sokoban and Lunar Lockout. In the first image above the white arrow points to your man. 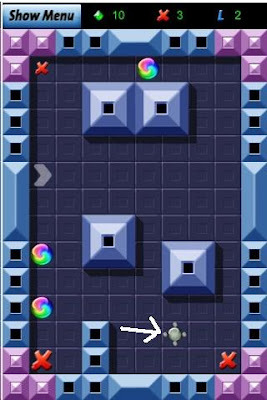 You must bump into the rainbow yin-yang balls to hit the red x's. The second photo shows an arrow that may switch directions. Another element, not shown, is the wormhole square - not on all levels. 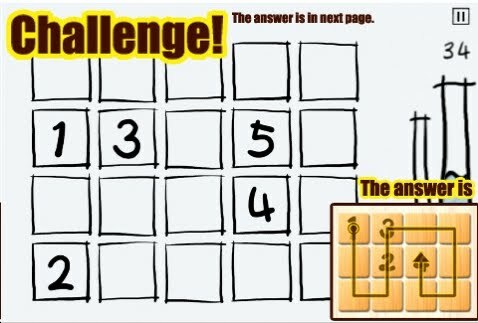 Free to download 5 sample puzzles. A level pack of 40 - I solved them all in about an hour and a half. I feel smart again! Note to Stefan: we look forward to level packs 2 & 3.